So I've been doing these pixel sketches, they are kind of a halfway point between pixel pushing and sketching on paper, and I thought, seeing as I'm doing a ton and plan to do a ton more, I'd start a thread for it here. I hope firstly that this style is acceptable for these forums, i'm not being overly messy, but i'm not being particular traditional either. To justify my approach I would say that the reductional nature of pixel line work means a lot of the distracting elements from other mediums (such as line weight) can be circumvented or controlled manually. As well, The fact that you're encouraged to work with a single clean line means you can focus a lot of energy on what a single given line is achieving, and edit to a very fine degree. For whatever reason with the process of refinement i find myself losing much less energy when working on these pieces then compared to any other medium i work in. Which is why it's exciting to me and why I thought I'd share it here. Liking this a lot not idea how i'll handle colouring tho. A little looser, might drop this one, unsure. 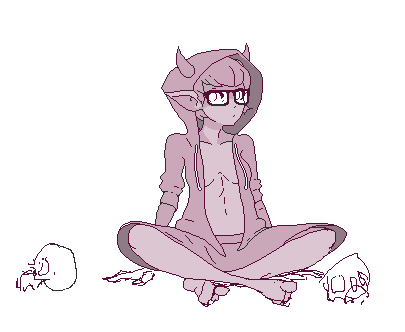 Probably treat this like demon ladies in terms of colouring. A lot of these works will be pushed to different degrees of graphical fidelity. I might go deep with the pixel tech into some but more often i'll keep it fast and simple. Speed is very important to me, if I can complete two works in the time it takes me to polish one, i usually will. Crits on structure, composition, pose, anatomy, expression ect are super welcome. Crits on pixel craft are also good but just keep in mind the rough nature of what i'm doing. 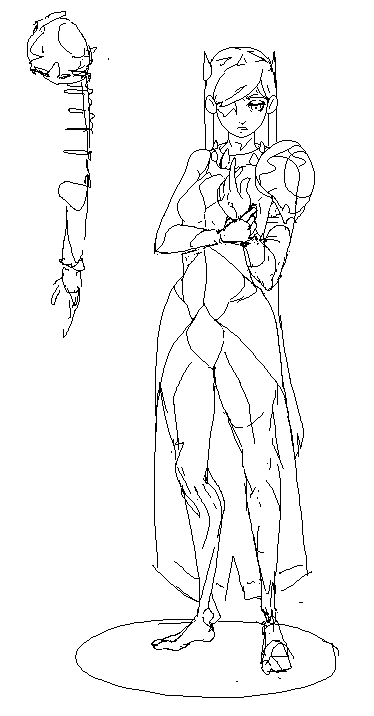 Not trying to squirm outta crits just probably not going to go AA heavy or densely shade many images. I probably won't redo images from scratch either unless you catch the work in the design phase, i'de just rather churn out what I have and start a new piece. (though i'll take the crits on board for the next one). I'll admit when I first saw them on PJ I found them a bit on the unfinished side, but I understand your approach and the energy in there largely makes up for it. I'd agree the technique might be less suitable for portraits though; potions guy is my least favorite, possibly because of lack of detail. Thanks for the nice words! Yeah the tech doesn't seem to suit portraits as well as i'd like. 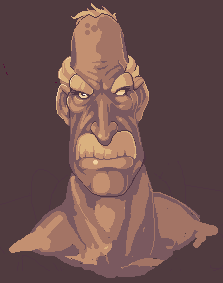 So I might be a bit more render heavy on that oldman wip. The guy you linked has some pretty cool stuff. I like the way he treats his colour and shading, i'm kinda assuming i'll naturally get a bit more complex and daring as I progress with these. And yeah, if any mods are reading I would rather this thread be in the pixel art forum but I thought i'd play it safe. So if you could change that, that would be great! Thanks dude, and as far as I can tell, talent has more to do with getting an easel out and doing lifedrawing with a good book next to you then anything, so don't be dispirited, anyone can learn. 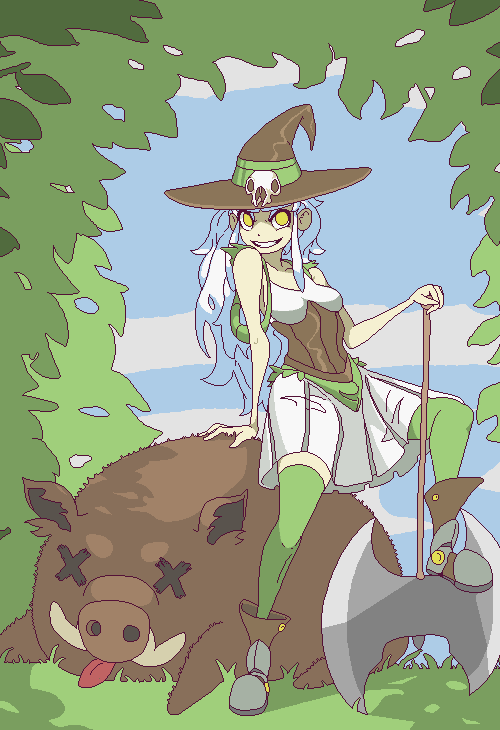 Latest demon girl is pretty much done, little worried about readability with the colours I've chosen, any thoughts? Is everything sitting okay? new butcher WIP. 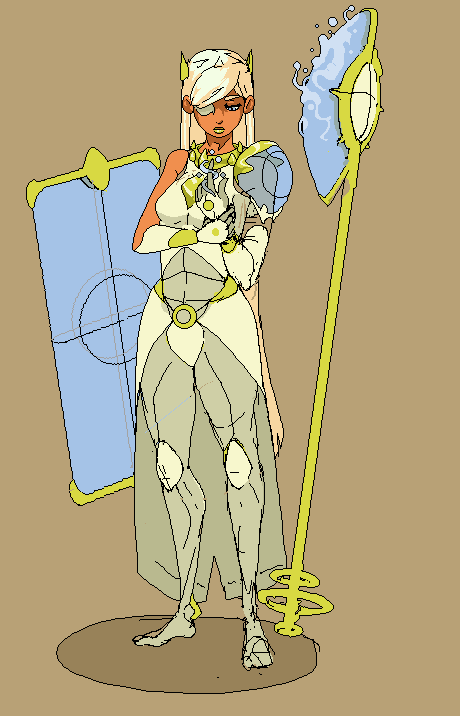 Also happy to get colour suggestions for this guy (weakest area). Beyond that i think i'll keep him pretty simple. 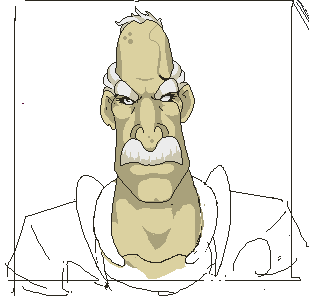 Beyond touch ups i''ll either finish up or toss out old man face next. So any directions that could make that image remotely interesting would be welcome. 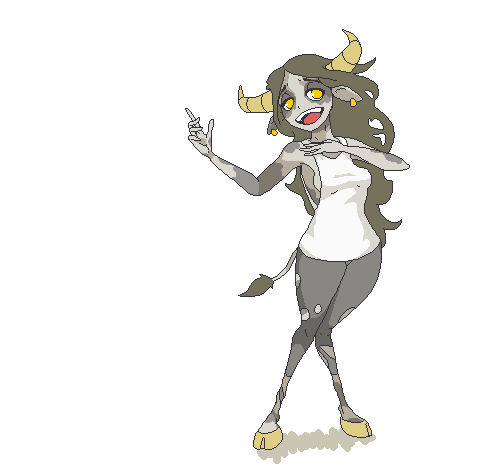 Demon girl's horns don't attach symmetrically on her head. The skulls are a nice touch but they might catch the eye too much. I'd try removing their outlines, and grouping them in one area a little bit more in the background ( = higher in the image). Needs a simple cast shadow as the other girls. these are great!!! wish i could draw like that! Thanks for the edit and nice words! your totally right about the ears, I pushed it in front of the hood but I couldn't bear to tuck the hood behind. Idk i just feel like that round bagginess is part of the charm of the outfit. I might reevaluate later tho. I also love ur lil horn touches there and may have copied that a little, albeit with slightly fatter horns. Removed the skulls, you were right they were a bit too distracting. 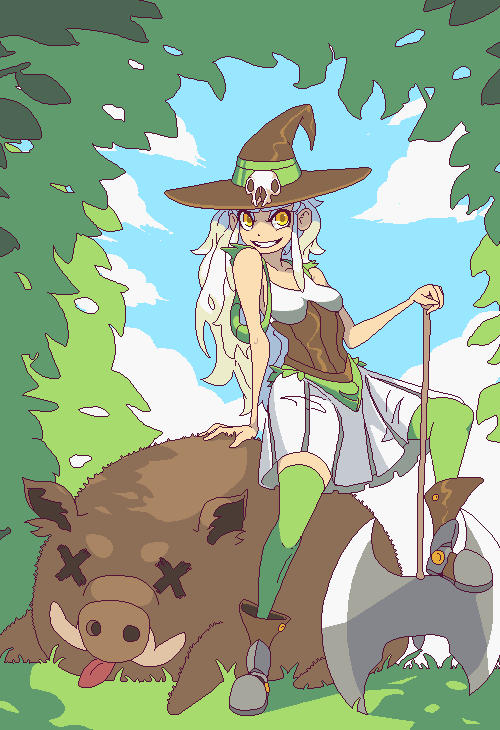 Fixed the horn positions and added the shadow. Cheers for pointing that all out. Okay so beyond any small tweaks and maybe messing with the hood a touch more i'm pretty much calling that done! 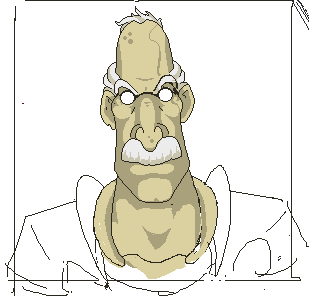 Moving on to old man face. Here is where it currently stands. 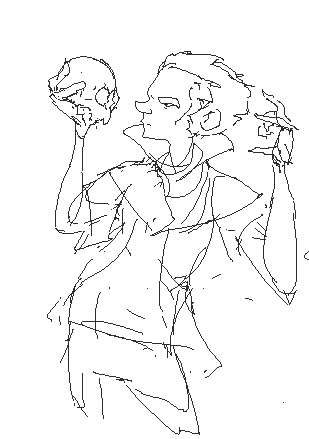 the heads slight jaunt is killing me a little in terms of lining the features up but i dug my own grave here. I have two versions, not sure which I prefer so any thoughts on that would be good. It's shaping up, but i'm still open to ideas in terms of a more interesting direction. Welp, did in fact end up going in for more refinement on this one. 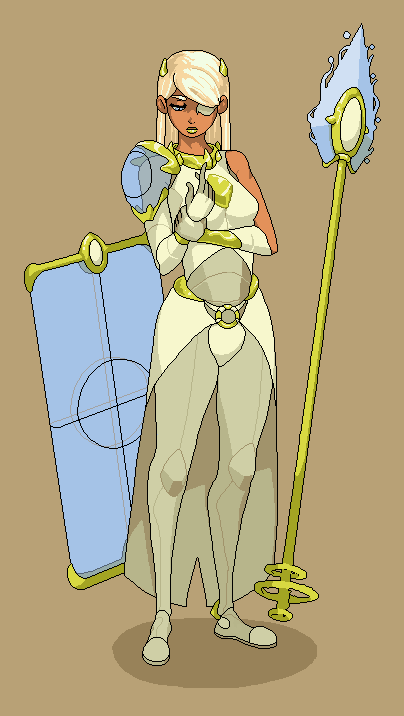 A lot of cleaning up left to do, maybe some light dithering? unsure. Not sure to what degree to add a body either. Also might hit the whole thing with sepia to get an old timey feel. Thoughts are welcome. Cool work! I like all of them, except for the butcher. He's giving me strong "fake anime" vibes, like those horrible shows from the early 00's. He's well drawn, he's just giving me flashbacks to terrible things. And yeah it's gotta a bit of a teen titans vibe to it doesn't it. Ahh well. 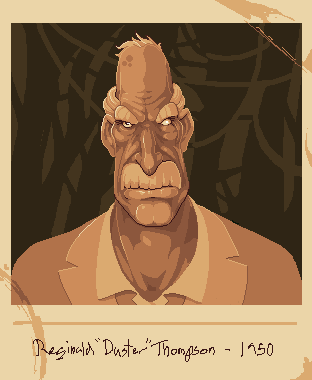 I ended up more or less finishing the old man, who is now named Reginald "Duster" Thompson. 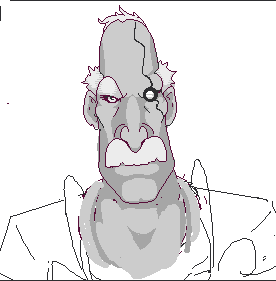 Went a little far what was meant to be a pixel sketch but I guess that's going to happen from time to time. 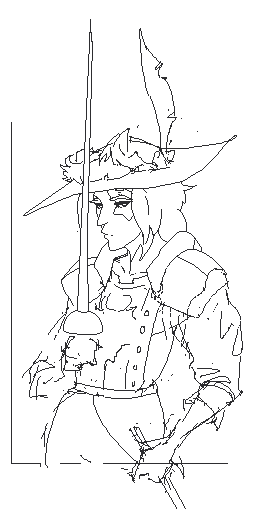 I think i'll tackle the fencer next, and ditch the caster and butcher. 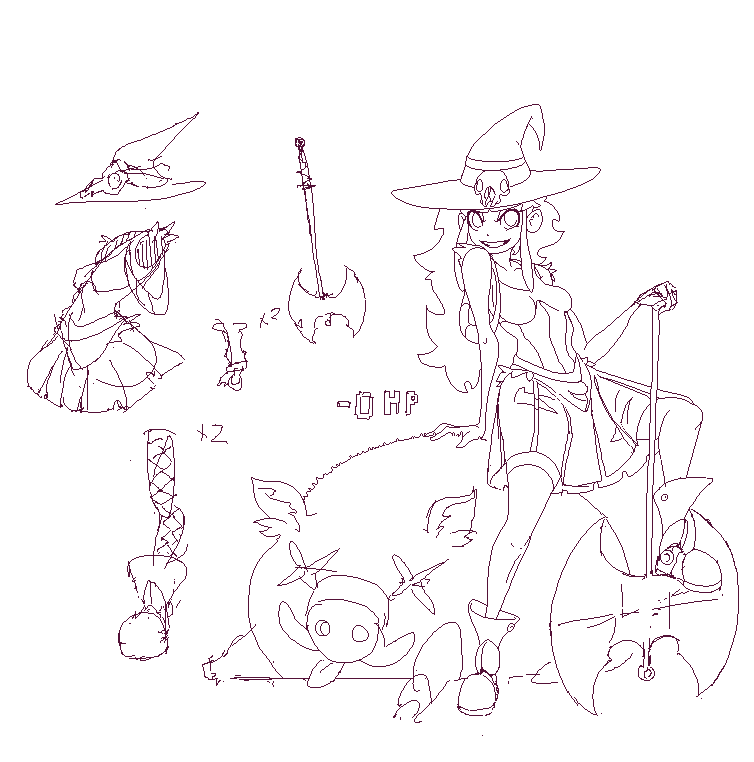 Also maybe do a new round of sketches.